This theme is difficult because the novel in many ways mocks the very idea of this theme. Like his predecessors Joyce and Proust, Nabokov plays with the fixed notion of time and space throughout Ada. Russia and The United States seem to be completely dislodged from actual geographical facts. Terra and Antiterra exist as parodies of Heaven and Hell even as they function as real places in the novel. With modern and postmodern literature and art, these fixed ideas are decentered in an effort to draw attention to how we come to understand time and space. How we orient ourselves in the world and the social relations which determines this orientation are the real areas of interest. The fantastic ways in which Nabokov undermines our sense of time and space should force us the think specifically about these notions in philosophical and critical ways. Since the main characters in the novel are simultaneously deeply romantic lovers even as they are sexually promiscuous and are engaged in an incestuous relationship, we should pay attention to these nostalgic ideals of love and romance, family and the destruction of family, family stability and incestuous union. The values and beliefs in a golden age are completely missing in Ada even as Nabokov seems to be at great pains to root the love of Van and Ada in something like this golden age. Ardis is an Eden, yet everyone in this paradise has fallen from grace. The novel would show us that the ideals of a golden age in which all was stable are really nostalgic fictions. As our characters behave in deplorable ways yet find each other in a resolution of true love, we see a paradise riddled with flaws but redeemed in many ways by the same flaws. 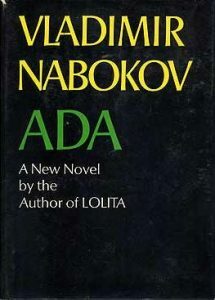 Nabokov’s Ada shares some things in common with Orwell’s 1984 and Huxley’s Brave New World in that it presents us with a vision of a not too distant future in which all of life is out of joint. The confusing geography and the role of Terra and Antiterra are examples of a world which has gone wrong. The novel suggests that if we continue to function in the world in the way we do, we will ultimately find an expression of life which is dark and oppressive, one in which the privileged few live in an idyllic place free of consequences and want while the rest of us suffer in a land of drudgery and difficulty. In many ways, this is the world we currently live in. Nabokov shows us how extreme this may come to appear.